Annie Macy's images of the physically integrated AXIS dance company are at Whetstone Restaurant & Brewery in July. 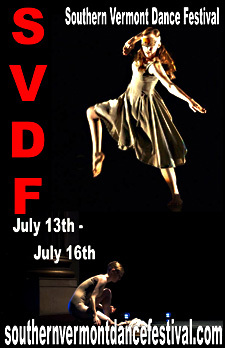 The 5th annual Southern Vermont Dance Festival is preparing to celebrate the breadth and beauty of movement with a four-day schedule of classes, performances, community events, and more in Brattleboro on July 13-16. Preparing the way is "MOVEMENT 2017," a multi-venue installation of twenty-two exhibits featuring "movement-inspired art of all kinds." Beginning on Gallery Walk Friday, July 7, and continuing throughout the month, these venues are showing work by twelve artists who celebrate movement and dance in paintings, prints, photographs, sculpture, and more—some work will be available for sale. Jeff Lewis's photos of Festival and other dancers, as well as circus performers, are featured at Superfresh! Café. 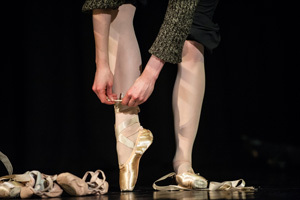 The Southern Vermont Dance Festival was birthed out of the aftermath of Tropical Storm Irene and the Brooks House Fire, and has an equal focus on promoting the arts and art excellence, and being an economic driver for the community. Brenda Lynn Siegel, Executive and Artistic Director of the Festival, has a degree in choreography from Hampshire College and has worked as a choreographer, administrator, and dance teacher locally and around the country. While Modern Dance is her specialty, she also teaches Jazz, Break Dance, Hip Hop, Ballet, Belly Dance, and Astanga Yoga, and for a dozen years has run a popular Break Dance camp for local youth. Seeing the need for a consistent and concerted effort to revive and help sustain the local economy, she decided to concentrate her effort where she knew best and in the community with which she was most familiar. Siegel knew that dancers would come, that they would shop and eat, and would be excited about Brattleboro's downtown community. And she knew that she could excite the community about dance. In its 5th season. the festival goals have been realized. Perhaps you love to watch dance—there are Galas galore. Maybe you have never walked into a studio in your life, but you would really love to learn—there are classes for you. If you are a dance professional or dance student, there is a wealth of works to see and classes to take. With four days of ticketed and free performances, over 113 classes, and a strong focus on community, this year's festival is ready to inspire! The festival boasts faculty and choreographers at the top of their field with a unique ability to serve all levels of dance, from the dance enthusiast to the dance professional, and everything in between. For the fifth year in a row the festival will host some major players in the dance world. SVDF is highlighting the beauty and strength in our difference by celebrating diversity and social justice. This festival welcomes back five-year veteran Billbob Brown, director of the Dance Program at UMass Amherst and former chair of the Hong Kong Performing Arts Academy. Billbob returns with a diverse selection of classes and a work that explores "the wall." Also returning this season are the Wondertwins, who will be teaching and performing. Some of their credits include Bobby Brown's "Don't Be Cruel" World Tour, New Kids On The Block's "Magic Summer Tour" (choreographers), Apollonia Kotero's "I Fell For You" World Tour, Jacob's Pillow Dance Festival, Brooklyn Dance Festival, and The Yard, in addition to dancing on stage with legends like Run DMC, LL Cool J, Public Enemy, MC Lyte, and Queen Latifah, to name a few. Some other featured faculty, choreographers, and companies include: Ted Thomas, former company member at Paul Taylor Dance, in addition to working with Ballet Hispanico, Elisa Monte, and the Murray Louis and Nikolais Company.... Mucuy Bolles, former dancer with Alvin Ailey, Feld Ballet, Zvi Dance, Complexions, Elisa Monte Dance, Buglisi/Foreman Dance, Lar Lubovitch Dance Company, and Broadway credits including "The Red Shoes," "The King and I," and "The Lion King".... Lisa Chow and Desert Dance Theatre, with a completed a trilogy of civil rights productions—"Free At Last," "Sister Moses: The Story of Harriet Tubman," and "Judgments"—and collaboration with live musicians.... Alison Cook-Beatty, whose work has been commissioned by Columbia Ballet Collaborative, Carolina Ballet Theater, Joffrey Ballet School NYC, Opera Dolce, NYU, The Boston Conservatory at Berkeley, Fort Hamilton High School, and Ballet Next. She has also performed with Paul Taylor Dance Company and Taylor 2 among others. For a complete list of featured faculty, choreographers, and companies, check out the lineup online. New to this season's festival is a Mid-Summer's Night Picnic and Promenade performance at Scott Farm; tickets are selling so quickly that early purchase is recommended. In addition, a Yoga Track has been added to serve those for whom yoga is the preferred movement form. Also new this season is a Community Potluck Dinner, a social justice/resistance performing arts tour of the downtown, and a mini dance film festival.... All this in addition to the usual three galas, informal concert, closing concert, dozens of community events, visual art exhibits, and 113 classes this season!